All Jams On Deck trailer from Robert Mugge. There are up close and personal Artist Workshops in which artists showcase their instruments and blues music expertise in a highly interactive workshop setting. 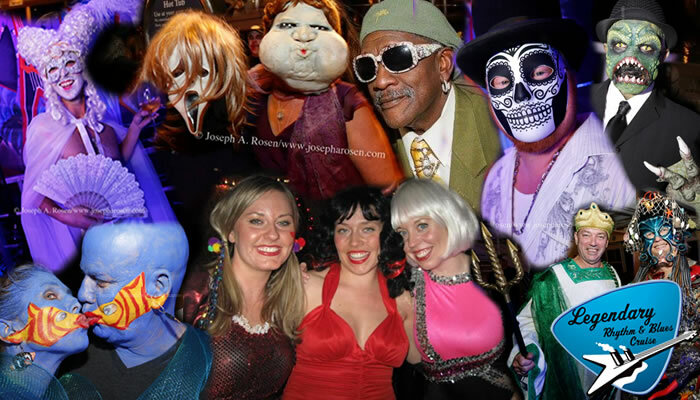 Autograph Signings afford you the chance to meet the Stars in person, and Industry Panels provide the ultimate in Blues Music networking. Additionally, passengers are invited to bring their instruments to play with one another or with the pros in two selective lounges. You never know who you’ll share a stage with! Taj Mahal, Irma Thomas, Jimmy Thackery, Elvin Bishop, Terrance Simien, Los Lobos, Marcia Ball and many others have even participated in Culinary Demos, linking the artists’ creativity and cultures to the palate in the ship’s state-of-the-art Culinary Arts Center. 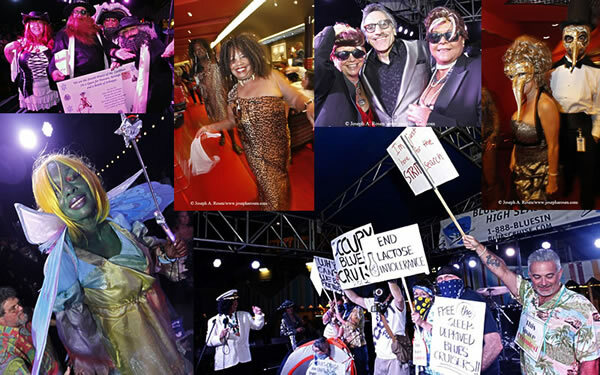 Theme Nights and our Legendary Mardi Gras Parade at sea also add to the fun! Whether the October Cruise gets your groove on, or our January Caribbean Voyage suits your tastes, you will have the Legendary adventure you’re expecting and then some. We have selected a variety of exotic ports that are music friendly, and of course you’ll enjoy the amenities of a five star full ship charter. Our cruises have SOLD OUT fourteen years running, so we encourage you to sign up today for the best available cabin selection. 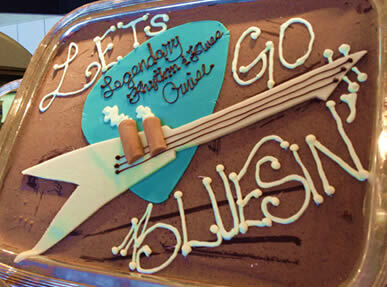 Many cruisers testify that The Bluesin’ Experience is life changing! Mo’ BLUESIN’ on the High Seas to ya! Blues Industry Professional for 37 Years! Above: LRBC CEO Roger Naber discusses the origins of the Blues Cruise. This clip features Little Charlie, David Maxwell, Shemekia Copeland, Susan Tedeschi and Tommy Castro. Produced by Talkin’ Blues Media, Inc.
You won’t find Legendary’s Pro-Jams anywhere on land! The bands on the ship have a week at sea to share memories, exchange lore from the road, kick back… and join each other on stage. Blues Cruisers have witnessed dream jam sessions and combos on these ships over the years, and the memories just keep building. The late-night jamming scene on the cruise is almost a separate world unto itself, appealing to the more extreme cruisers who don’t mind going without sleep in order to hear their favorite artists really stretch out on the music and improvising under the night sky. Remember, if ya snooze, ya lose! Tommy Castro Pro Jam from the Robert Mugge film ALL JAMS ON DECK, a presentation of Legendary Rhythm & Blues Cruise. Copyright Mug-Shot Productions and Legendary Rhythm & Blues Cruise, LLC. Kim Wilson (Fabulous Thunderbirds) Pro Jam from the Robert Mugge film ALL JAMS ON DECK, a presentation of Legendary Rhythm & Blues Cruise. Copyright Mug-Shot Productions and Legendary Rhythm & Blues Cruise, LLC. Once making your way to the pier and boarding the ship, you’ll be greeted with a host of unannounced “Surprise Guests” on the ship. You never know who will be announced! Surprise Guests join Artist Spotlights, Pro Jams and participate in Industry Panels and Workshops. It’s just another element of your Legendary experience. Previous Surprise Guests include: Sir Mack Rice, Tito Jackson, Taj Mahal, Bobby Rush, Koko Taylor, Dion, Lonnie Brooks, Smokin’ Joe Kubek & Bnois King, Mike Finnigan, Leon Blue, Ronnie Baker Brooks, Debbie Davies, Todd Sharpville, Paddy Milner, Commander Cody, Terry Hanck, Steve Gannon, Fiona Boyes, Roy Gaines, Jellybean Johnson, Tony Braunagel, Tasha Taylor, EG Kight, JT Lauritsen, Danielle & Kris Schnebelen (Trampled Under Foot) & many more! What’s the best way to cap a wee-hours jam in the Piano Bar? By kicking back with your morning coffee midship with the cool sea breeze blowing through your hair… right? Not on this cruise! No, this ship starts rocking early. Spotlights have included “Boogie Woogie” Piano Extravaganzas, Harmonica Workshops, Songwriters’ Discussions, Guitar Workshops, Drums & Percussion Gatherings… even New Orleans Cultural Workshops and Storytelling. This all happens well before noon, and much like Legendary’s Pro Jams, it’s not uncommon to see a host of headliners and star sidemen line the stage for a unique introspective on the minds, methods, and techniques behind the Rhythm & Blues genre. Legendary’s Autograph Sessions give you a chance to meet your favorite artists in a very intimate and personal manner. There are two sessions during the week, one for early dining seating passengers, and the other for late seating passengers. Photos with Artists are allowed unless otherwise posted. What to sign? Commemorative Posters and Apparel are in the Bluesin’ Bazaar on the ship and are perfect for capturing this multitude of autographs. You’re also invited to bring albums, instruments, photos or other keepsakes for signatures. The Jamarama is a special electric venue created for passengers and professional musicians to jam together. Pro-Passenger Jams are coordinated to give individuals, groups, or touring pros a chance to perform. Pros are often spotted playing other instruments than the ones typically seen by you at their shows. Jamarama Hosts coordinate the jams so drop in, tune in and turn on your axe. An appreciative audience will be waiting to check out the action! Not only do Legendary Artists cook on stage, they stir the pot in our Culinary Demos and Artist-hosted Sailaway BBQs! Irma Thomas, Los Lobos, Elvin Bishop, James Harman, Jimmy Thackery, Marcia Ball, The Lowrider Band’s Harold Brown, Taj Mahal, Shemekia Copeland, Los Lobos, Theodis Ealey, Chubby Carrier, Chef T.J Hill, Floyd Taylor, Super Chikan, and a host of artists have participated in what has become a cruiser favorite. Best of all, you’ll sample the food and the artist’s creation is usually available as a selection on the Dining Room’s evening menu.